At the center is a visual expression of the Trinity, threefold in organization yet with a suggestion of infinite complexity. The surrounding areas are organized into triangles, which again symbolize the Trinity. 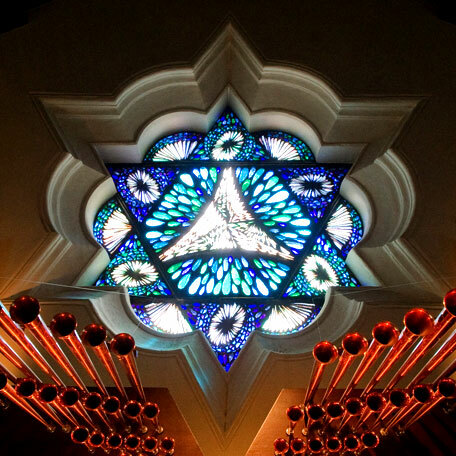 And further, the two large triangles seen superimposed, forming together the Star of David, suggesting the origins of the church. The Trinity motif appears here as a descending spirit of multiple blessings and divine Grace. The chalice of wine stands for the living church through which the communicant may receive the blessing of divine Grace. There are also muted expressions of small forms and the horn of the unicorn woven into the design. Throughout all of the windows there is the theme of God meeting the events in the lives of people; and here we have the New Testament Faith and that which sustains our unity with God and those who believe in Him; the wheat and the grapes, the bread and the drink of life in Christ. It is appropriate at this window is in the area of the future Chancel where the Holy Communion will be celebrated and received by the people. Man is born into this green world and within his grasp are the blessings of the divine Grace. The beginning is joyous, the prospect seems infinite — a future in which all good things are possible: the emergence of life in all its freshness, the uninhibited joy of new creation, the joy of birth and childhood. The highest order of creation is man, in whom God has placed the responsibility of administering His world. The response of man is — at its best — vision and idealism. Man comes from the earth; there is pain of birth when he is born into a family; adolescence. Man grows from childhood into an awareness that even though the power of the Trinity, from which all life and well-being flows, surrounds us. He must seek also a spiritual maturity and the fulfillment by his own efforts. He climbs the tree of knowledge. His endeavors are made either more or less difficult by his worldly fortune, expressed here by the radiating wheel-like form around the base of the tree. Green, in both windows 1 and 2, is used to symbolize growth. Man’s life is entered by God. Suggested by bursts of light in center, both dramatic and explosive. Here man and woman are dominated by the forces of nature, expressed here by their kneeling positions and by the earthy colors of their garments. To the right of the kneeling woman may be seen the pomegranate (the seed and the word) from which grows the tree of Jesse, the religion of the Old Testament, producing the scales of justice in the law as its fruit at the apex. In the central area above the cross to represent the Passion of Christ, the New Testament. The red winged forms of the four eangelists radiate from the cross towards the four corners of the earth. Above, center, is a chalice, representing the new faith; and above all the radiant eyes of God the Father, peering down from within the Trinity. Man responds variously to God’s intervention: the entwined rings represents matrimony; the yoke, his burdens responsibilities; the distorted cross his doubts about God and himself; the ruddy coloring suggest fire and the inhumanity of man to man. Yet above all these there is the anchor of hope, and above that the omniscience of the Trinity. Man is caught in the maelstorm of earthly struggle and temptation; swirling waters, lightning, tempest and flood; and beside him the tempting sword of brute force. Yet, above all soars the symbol of the Trinity expressing calmness, peace, the belief that evil shall not prevail. Man’s struggle against negligence (those things which he should have done and did not do) and indifference (for whom the bell tolls). Man walks away shrugging his shoulders from a welter of discarded obligations. The scales of justice lie broken and ignored in the foreground. A grotesque mask occupies the lower right hand corner, representing the irresponsible pleasures which harm others. At the lower left lies the maimed and diseased body of humanity, the result of the misunderstanding and laissez faire. Also scattered among the rubble of civilization are a serpent, a skull, the rusting cog wheel of industrial waste, barbed wire of barricades, and the crumbling ruins of war. A cross, here ruined and neglected, is barely recognizable on the man’s right, while he faces indifferently the enormous energy of atomic power, which may be turned into the bane or boon of human existence. Yet in the spirit of man’s neglect and indifference, above and beyond all hovers the omnipotent Trinity. Dean Usher suggested the subject of this window as “the maturity of life lived with God blossoms as a flower in full-bloom, colored in peace and stillness.” Indigenous plants and flowers were chosen, and occupying a lower central portion of the desert’s crown of thorns. 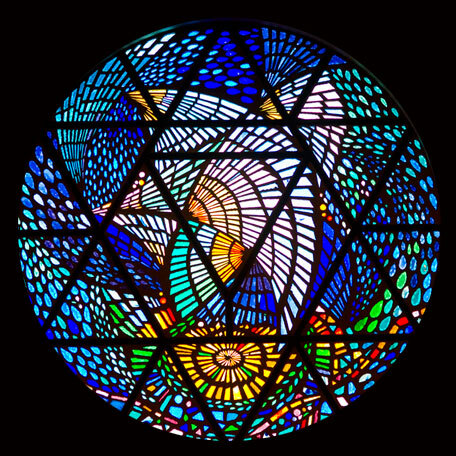 In this window the winged symbols of the Trinity come closer to earth and occupy the center. The phoenix bird and the trumpeting angel symbolize the Resurrection. At the foot of this window may be seen the mariner’s compass pointing the way for the ship of the Church to all parts of the earth. Immediately above the ship is a representation of the Passion: the head of the suffering Christ on his cross, surrounded by the flaming heart of charity (“for God so loved the world that he gave his only begotten son”). Again, above all, is an expression of the serene Trinity. The apotheosis of Christ, no longer suffering His earthly Passion, but One in All with His living Church and His cross, the arms of which are raised in benediction. The depths of light behind the cross suggest the infinity of space and the universality of His teaching. The color suggests that man’s concept of a vision of God when we shall see Him as He is, goes on after bodily death, the ultimate end of the journey of life being symbolized by the golden glory at the top. His head is no longer the head of a man but a radiance of light and hope for the world under the eternal Trinity. Christ’s teaching of a future life, the New Jerusalem, Kingdom of Heaven, the spiritual city of eternal light and life, whose maker and builder is God. An angel measures the city, with a large reed, and the brusting golden light at the top is the ultimate reality which man hopes to find under the blessings of the Trinity. The original Rose Window, north, was designed and installed in 1986 by J.R. Lupkin Studio. This window was destroyed by fire on October 10, 2002 and removed. A second and the current window depicting Creation was designed by Vada Roseberry, a regionally known painter and parishioner, built and installed in 2004 by Terry Wyers (JR Lufkin Studio) now Utopian Glass of Mesa AZ. 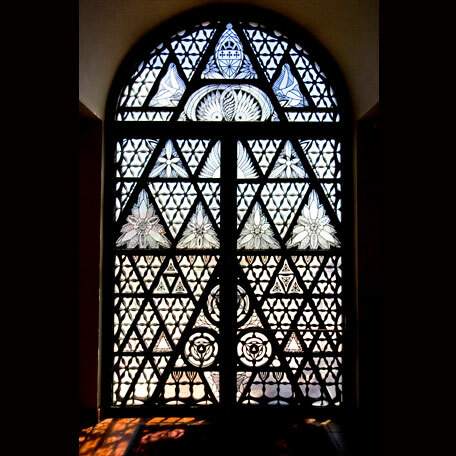 Like the Rose Window, south, this window contains a six pointed Star of David, which is integral to the window’s physical structure. As in the South Rose Window, it represents the continuity of the Judeo-Christian tradition. In this image, the Trinity, symbolizing God at the creation, hovers above the yellow disc of the newly created earth. Below it, on the left side, is a white band, the union of all the colors of the spectrum, on the other side, the different colors of the spectrum show creation in all its diversity. The inspiration for these doors came from the open Spanish grillwork of wrought iron. In warmer countries, such as Puerto Rico or southern Spain, this grillwork would have been left unglazed. To solve the problem of Arizona’s heat extremes, they conceived the idea of feeling in this grille with lightly-worked leaded stained-glass. The interwoven triangles in the overall design of the door make up a tree of life, reminiscent of Spanish American and Mexican folk art design.